June 15, 2013, Victoria, BC (ISN) – The Victoria Eagles and North Delta Blue Jays split their double-header Saturday at Lambrick Park, with the Eagles coming away with a 1-0 extra-inning win in Game 1, while the Jays prevailed in Game 2 by a score of 3-1. In Game 1, Eagle’s left hander Kurt Horne made just his second start of the year and quickly showed everyone why the 6’4 hurler is on the roster of the Canadian Junior National team, throwing 3 and 2/3 perfect innings before an error in the 4th allowed the Jays only base runner to that point. 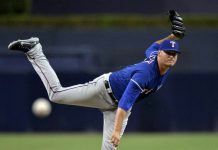 Horne would get out of that inning without issue, and in fact would allow just one other Jay to reach base – a 5th inning single by Mitch Boychuk – through the first seven innings. Unfortunately however for the Eagles, Horne’s counterpart on the mound, the Jay’s Ryo Takenaka, was being equally effective and kept the Eagles offence in check, allowing just a single leadoff hit from Ben Goertzen in the first inning, while coming through with a pair of bases-loaded, inning ending strikeouts in the sixth inning to extinguish the biggest Eagle’s threat of the game. After a scoreless seventh inning, the game went to an extra eighth inning and the Jay’s Boychuk greeted Horne with a leadoff single. After a sacrifice bunt moved Boychuk to second and a pop-out by Riley Grewal, the Jay’s Trent Fletcher singled to left, but a perfect throw to the plate by the Eagle’s Mitch Hawkins kept Boychuk from scoring and kept the game scoreless. 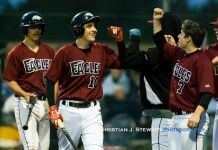 The Eagles would use that play to their advantage and with one out in the bottom of the inning, Kyle Murai and Vinnie Martin would notch back-to-back singles, putting runners at the corners. Gobind Sall would then strike out, and with a two-strike count on the next batter Brett Hull, the Jay’s Takenaka would bounce one in the dirt and to the backstop, allowing Murai to score and give the Eagles the dramatic 1-0 win. In the second game of the day, pitching again would once again rule the day, but this time in favour of the Jays, as their starter Luke Manuel would spin a one-hitter – a second inning triple from Gobind Sall – to get the win. Manuel received good offensive support, as the Jays would scatter 12 hits in the game, six each off Eagle’s starter Ethan Skuija and reliever Adam Bontkes. Those hits would lead to runs in each of the first, fourth and sixth innings, which would be enough for Manuel and the Jays to come away with the win. Offensively for the Jays, Brad Antchak, Bryan O’Hara and Jordy Cunningham led the way with a pair of hits each, while Clint Taylor, Grewal and Antchak had the North Delta RBIs. With the split, the Eagles move to 14-12 on the season and sit in 6th place, just a half game back of the Abbotsford Cardinals who the Eagles face Sunday. The Blue Jays record sits at 13-17, good enough for 9th place, a single game back of Vancouver for the eighth and final playoff spot. As noted the Eagles are right back in action on Sunday, as they meet the Abbotsford Cardinals for a pair at Lambrick Park, beginning at 12 Noon.